Whenever I needed a relaxing place to enjoy a cuppa coffee and read a book around town, a few choices definitely pops up in my mind. Familiar names such as Starbucks and Coffee Bean are surely in the list but lately, another newcomer in Malaysia's franchise gourmet coffee scene joins that list as well. 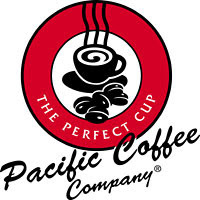 In comes Pacific Coffee, a coffee chain originated from Hong Kong which is now receiving rave reviews in Malaysia. Located in 2 places, namely Puchong & KL this little coffee place has been the talk around town lately. Me myself first heard of this brand during a marketing event where Pacific was serving coffee and snacks for guest of the event. And after I tried my first sip of Pacific Coffee, I was immediately hooked. They got shared computers here! A first in Malaysia I must say. Now I dont have to bring my lappie around anymore! woohoo! Choices are plentiful too, prices are cheaper than the other 2 coffee chains as well! On this particular day I decided to have an ice mocha, and a couple of my friends had the hot mocha and ice latte and a hot mocha. The flavour of coffee here is a little bit milder than the others, yet much smoother and with a much lower acidity level; a taste that I find fits most Malaysians perfectly well. The aroma is still there, probably from the roasting process and boy oh boy are they good or what. The snacks here are not too bad as well. My favorite would have to be their chocolate rolls, crunchy on the outside, richly chocolaty inside. yumz. Prices of coffee here are general a few ringgits cheaper than the other 2, so are the snacks. Lunch is served here but I havent not tried it yet. One of these days die die must try because they looked soooooooooo tasty on the picture! Here's a map of IOI Boulevard for you readers. Pacific Coffee is facing LDP. They do have shops at Fahrenheit 88 and Pavilion as well.